If you're looking for a dependable work vehicle that can be customized to your lifestyle, head on over to Federico Chrysler Dodge Jeep Ram! Our friendly staff would be happy to give the full list of available trims, set you up with a test drive, and go over our competitive financing options. It all starts when you visit us at 1875 East Edwardsville Road in Wood River, IL! With nine different trim levels and several available bed sizes, the Ram 1500 is ready for all kinds of workloads. Start with base Tradesman if you simply want a vehicle that can handle moderate projects and stay within a tight budget. As you go up in the list, you'll be able to enjoy additional passengers with the Quad Cab, off-road exterior packages, and much more. Bed lengths range from 5-ft. 7-in. to an incredible 8-ft. Attract attention wherever you travel with available exterior colors like Granite Crystal Metallic, Robin Egg Blue, Black Forest Green. After all, a work vehicle can be functional and attractive. Now we'll take a look beneath the surface of the 2018 Ram 1500 to see just how durable this model is. You can't see it, but the high-strength steel frame features eight ultra-tough crossmembers and a hydroformed tubular front frame unit to withstand even the toughest projects. This frame also provides safety with side-impact door beams and dynamic front crumple zones that create a barrier around the cabin in the event of a collision. 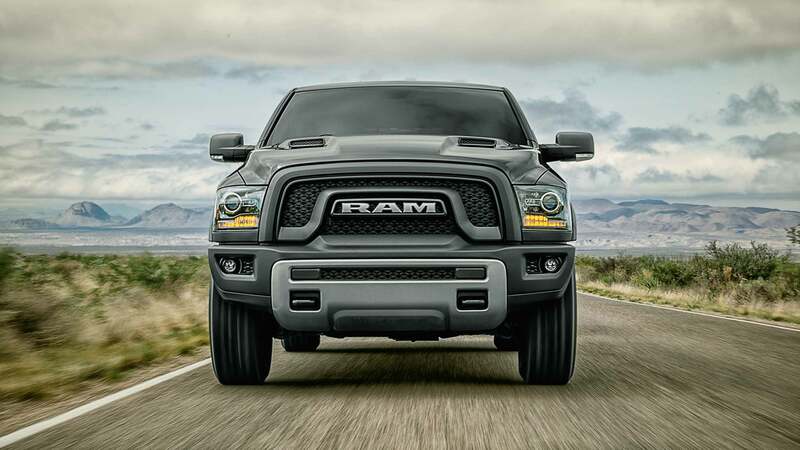 Carrying large loads can cause serious wear and tear on the brakes, which is why every Ram 1500 comes standard with four-wheel antilock brakes to ensure that you can stop on a dime. The numbers speak for themselves when it comes to the capability of this truck. Depending on the powertrain and the trim level, you'll have access to 395 maximum gas horsepower1, 420 lb.-ft. of maximum diesel torque, plus a maximum gas towing2 of 10,620-lb. and a maximum gas payload2 of 1,880-lb. for transporting equipment. The Ram 1500 also includes options you won't find anywhere else, such as the class-exclusive3 Active-Level™ Four-Corner Air Suspension and the class-exclusive3 TorqueFlite® 8-speed automatic transmission. Whether it's a trailer, lumbar, or a small boat, towing is a major factor. Thankfully, you'll have modern technology on your side with Hill Start Assist, which automatically applies the brakes to minimize the chance of rolling when you are traveling at an incline. Trailer Sway Control4 is ideal for a long journey down I-70, as it detects abnormal movement from a trailer and can apply brake pressure to correct it. When backing out of the driveway or a tight parking space, the ParkView® Rear Back Up Camera5 is the helping hand you need to better detect potential obstacles. Now it's time to visit Federico Chrysler Dodge Jeep Ram and test drive the 2018 Ram 1500 for sale near St. Louis, MO! 1 When equipped with the 5.7L HEMI® V8 engine with eight-speed automatic transmission. 2 When properly equipped. See dealer for details. 3 Based on the Light-Duty Pickup Segment. 4 Always drive carefully and consistent with conditions. Always wear your seat belt and obey traffic laws. 5 Always check entire surroundings visually before backing up.